Who has hours and hours to spend at the gym nowadays? Not many people, and that is why Tabata workouts have proven so successful. They are perfect for when you need to pack your exercise routine in a short amount of time, without losing efficiency. Be prepared to push through the intensity if you wish to get results. The workout we’re describing below is perfect for building strength and burning fat. It is composed of 5 moves which need to be performed for 40 seconds each, with a 20 second break between moves. The 5-move sequence needs to be repeated twice, without a break between sequences. You will need a gym timer (actual timer or timer app) and a training mat or towel to lay on the floor. - Get into plank position. - Pull one knee up and in toward your midsection. - Repeat with your other knee. - Continue alternating the movement with both knees. - Lie on the floor with your legs straight out in front of you. Bend your knees and lift your feet. - Inhale while pulling your legs towards your torso. - Exhale while lowering your legs back to starting position. - Starting on your elbows and toes, engage your core before you start. Keep your hips as still as possible, push up with one hand then the other until you are propped up in a push-up position. - Lower back down to your elbows one arm at a time. Halfway through, change your leading arm so you strengthen the other shoulder as you press up to your hands. - Lie on the floor. Place your hands behind your head. Raise your legs. 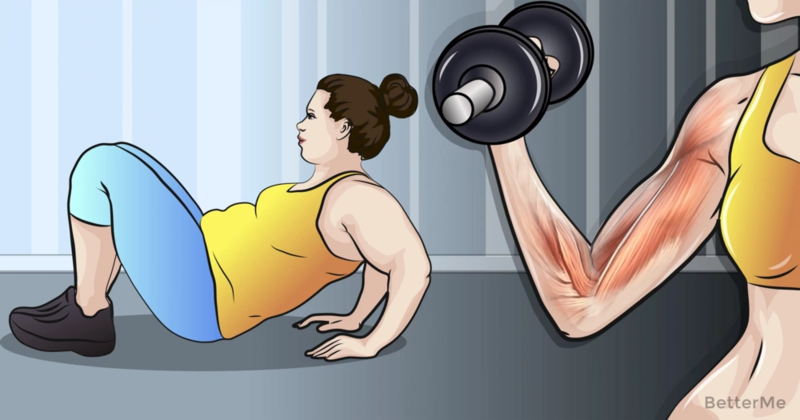 - Touch your right elbow to your left knee. - Now touch your left elbow to your right knee. 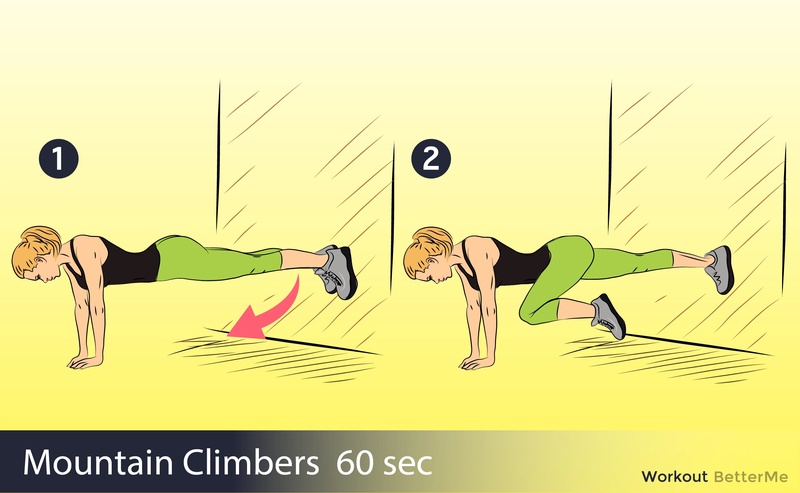 - Start out in a plank position with your elbows on the mat, on your toes, with your stomach off the mat. Your back should be straight. 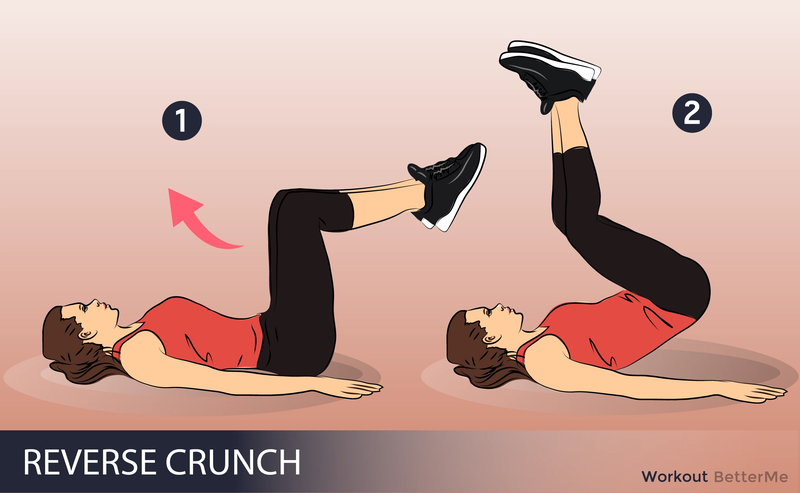 - With your belly button pressed in, twist your left hip until it slightly touches the mat and then back to the plank position. - Twist so your right hip slightly touches the mat and return to the plank position.